Since March, retired Marine Capt. Andrew Bement has been trekking the Appalachian Trail , despite the fact that life as an infantryman turned him off hiking as a sport. Yet he continues on, accompanied only by his service dog, Mozzie. For it’s on the trail that he’s discovered the therapeutic power of nature, as he struggles with the physical and hidden injuries of two wars. “I walk for healing, and a renewed sense of self. Every step that I take is a step towards a new life. A step towards leaving the ‘old me’ behind and working towards discovering exactly what I'm meant to be,” Bement says. Bement was medically retired in March 2015 due to traumatic brain injury and post-traumatic stress. And while he’s reveled in the solitude of his back-country journey, he understands that ultimately he can't hide from society. This realization has led him to join Walking With The Wounded’s Walk of Britain expedition, a 10-week, 1,000-mile journey through Scotland, Wales, and England to highlight the extraordinary determination of those injured in combat. Walking With The Wounded is a charity in the United Kingdom established to support the employment aspirations and vocational outcomes of wounded, injured, and sick servicemen and women — those who have been physically, mentally and socially disadvantaged by their service. Bement, who resides in Orono, Maine, is being sponsored by the Bob Woodruff Foundation to represent the United States, along with fellow medically retired Marine Sgt. Kirstie Ennis. 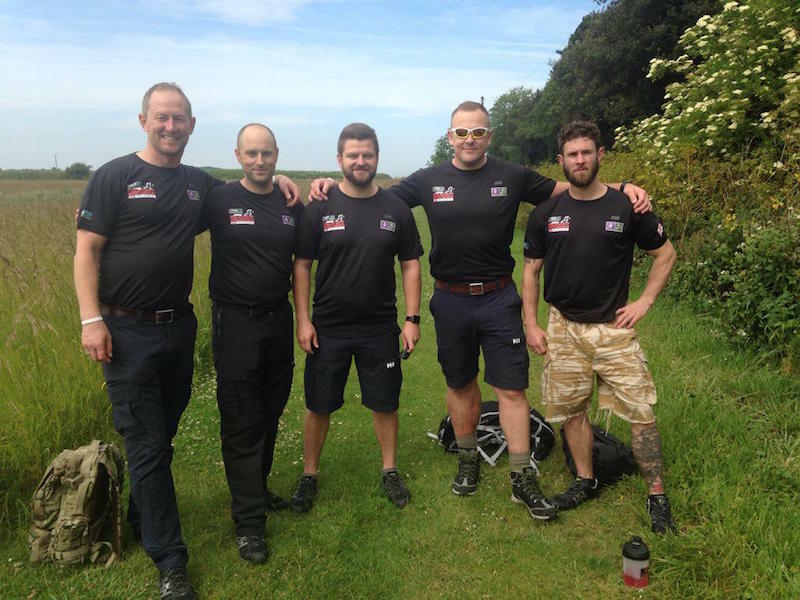 Andrew Bement (center) met fellow Walk of Britain teammates, Stewart Hill, Matt Fisher, Alec Robotham, and Scott Ransley for training in Norfolk, England, June 23–25, 2015. Bement has long sought out challenges. Born in Arizona, yet raised in Pennsylvania, he recalls growing up with great indifference toward adulthood, but knew that something was lacking in his life. After graduating from Wilson High School in 2003, Bement attended a culinary school in Philadelphia for two semesters. He returned home and attended a community college for another year. During this time, Bement spoke with the recruiter again and enlisted as an infantryman in 2003. Upon completion of training, he served with 2nd Battalion, 1st Marines, for two combat deployments to Iraq, serving in both the First Battle of Fallujah, and Operation: Steel Curtain/Iron Fist along the Syrian border. After his deployments, Bement, a sergeant at the time, was accepted into the Marine Enlisted Commissioning Education Program. He attended college at the University of Maine, where he met his wife Danuse, and was commissioned as an officer in May 2011. After completing The Basic School and the Infantry Officer Course, Bement was stationed at Camp Lejeune, North Carolina, with 2nd Battalion, 8th Marines, where he deployed to Afghanistan as an infantry platoon commander in 2013. It had been nearly eight years since Bement’s prior combat tours, which he considers the root of his post-traumatic stress. Like many combat veterans, he knew that something was wrong, but shied away from treatment, because in his mind treatment meant no longer being able to serve — and it most likely would have excluded him for his commissioning program. Eventually, Bement’s troubles extended beyond sleepless, nightmare-filled nights. With each helicopter raid, he became increasingly irritable and unable to control his emotions. He experienced panic attacks. “Being personally devoid of any true drive, or positive emotions, is no way to live. From such a condition stems many personal, life, family, and social problems,” he says. Bement returned to the states in July 2013. Under treatment, he discovered that in addition to post-traumatic stress, he had a traumatic brain injury that he was unaware of, that likely occurred throughout his service. 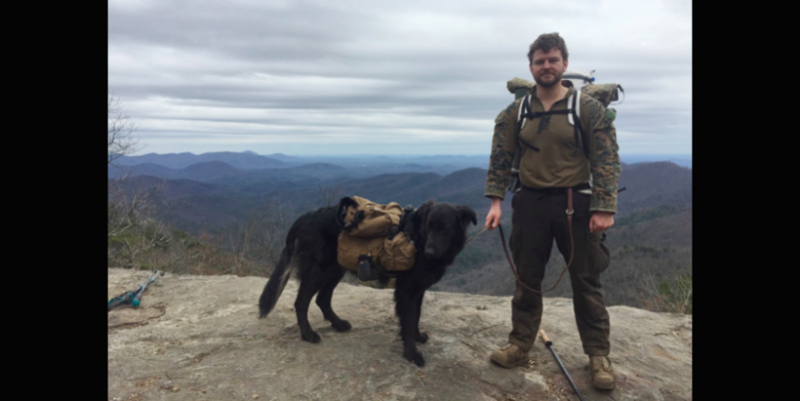 Andrew Bement and his service dog Mozzie trek the Appalachian Trail. While it’s only been a few months since he separated from the military, he already greatly misses the camaraderie of his brothers in arms. Bement looks to the Walk of Britain as an opportunity to fill that avoid. His recent introduction to the British team for a training event in England has already been a positive experience. “Meeting the team for the first time was like stepping back into a former life. I instantly felt at home, was welcomed as one of the group, and after only just meeting, it feels like we've know each other for ages,” he says. The Walk of Britain begins in Scotland on Aug. 22, and will conclude in London on Nov. 1. It has already gained the support of Prince Harry who is patron of the expedition. A combat veteran himself, Prince Harry is expected to join a portion of the walk. Beyond the core team of four British and two American veterans, sponsors of the walk have been assigned their own weeks, during which additional walkers can take part. For the Bob Woodruff Foundation, that will take place Sept. 21–28, in Wales, beginning with Mount Snowdon. The Bob Woodruff Foundation is seeking sponsors for the Walk of Britain, which presently includes the Steven and Alexandra Cohen Foundation. Donations in honor of the walk, to benefit programs reaching injured veterans and their families, can be made online here.